My oldest daughter will be three next month. The last three years have gone by extremely fast, almost in a blink of an eye. She has taught me so much and we have grown so much together. She is beautiful, smart, powerful, and has done super hard things in the last three years. And she never ceases to amaze me completely. The last couple weeks she will walk up to me, rub my face, and say "mommy you beautiful"-talk about my heart being completely melted and I tell her right back that she is beautiful as well. And then she will run over to baby sis and tell her she's beautiful! This week we added to that positive affirmation she came up with.. We will look in the mirror and say "I'm beautiful, I'm strong, I'm powerful, I'm smart, and I can do hard things". Her speech is getting better every single day and I can really make out what she is saying these days, so these positive affirmations are sticking with her more and more. She is starting to understand what we're talking about. She gets that these things that we're saying are good for us by our tone of voice and the smiles we have while saying them. Good for our soul. Good for our brain. Good for our self esteem. Good for our body. Good for our health. And most of all, these affirmations are excellent for our mental health. In today's society it is extremely important that we raise our young daughters this way. 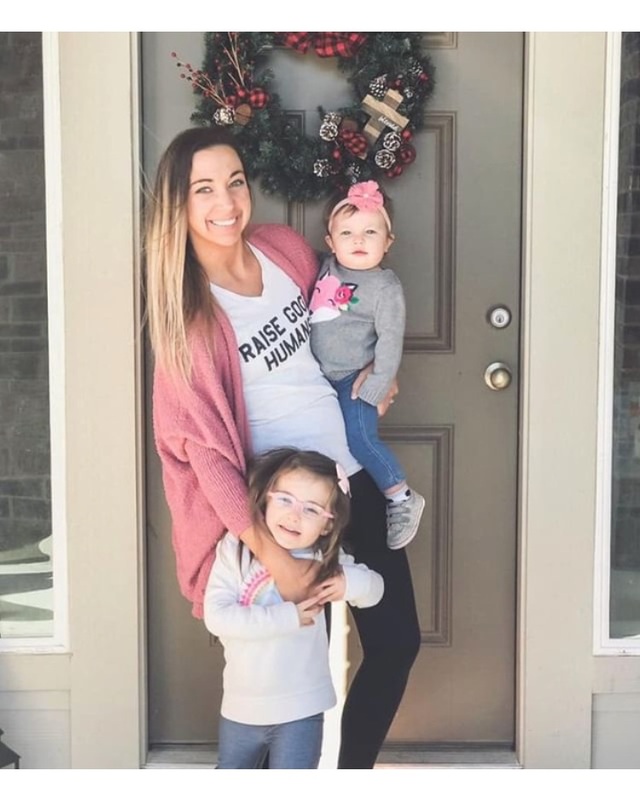 I only know how it is to be a girl mom, so in no way am I bashing the boy mom's out there because these affirmations can be said to them as well! But as a Mom to two young girls, these things need to be said to them starting at a young age so they know they are capable of anything they put their little minds to. And with everything that is out there on the internet, on televisions, billboards, store shelves, etc, it's important for us parents to teach our daughters to love every single inch of themselves. The stretch marks, the dimples, the freckles, the beauty marks, and the scars. We as parents have to break the mold that society has somehow instilled in all our minds about how it is to be a girl. I'm raising my girls to know that yes, you are beautiful but beauty does not define you. You are also smart, powerful, strong, and you can do hard things. We all have stories to tell. We all have things in our past that have broke us down and we could have been out for the count because of those things. But I want my daughters to know that even though life is hard and it is scary sometimes, as a girl you are so strong and you will have so many opportunities that you should take along the way. So right now I'm pushing the positive affirmations on an almost three year old and 15 month old. I want these things so lodged into their brains that if anyone ever tells them they aren't smart enough or strong enough because they're a girl, they automatically will know that that isn't true. They will know they are beautiful but that just because they are beautiful doesn't mean that will tell the world who they are as a person. And that they are so powerful beyond belief because they trust in the good Lord to help them walk their every day journey down here on Earth, and that He will light their way. As a Mom who struggles internally every single day with anxiety, I'm taking this page out of my parenting book and putting it into my self love book. If I tell my daughters every single day that they are beautiful, smart, powerful, strong, and that they can do hard things, I better be telling myself that. We are never too old to change our way of thinking about ourselves. And as a person who struggles with looking at the positive side of things about myself, these affirmations can apply to me so much. I need every single person that has read this to stop, look at yourself in the mirror and tell yourself that you are beautiful, you are strong, you are powerful, you are smart, and you can do hard things. And I want you to believe yourself when you're saying these things to yourself. You have to believe yourself. You deserve to believe yourself. If we are going to make small changes to the future of society, if we want our daughters to believe these things about themselves that we are engraining in them, then we as their parent need to believe these things about ourselves as well. Listen up society-us girls are so much more then we've ever been. We're breaking the molds. We're breaking boundaries. We're going farther and farther every single day. We are girls, hear us roar. And we will continue to do all of these things. We will continue to change society everyday. Let's keep saying these things to our daughter's and to ourselves. Let's keep pushing the boundaries because they are only going to change if we push for it. And let's be strong together. We can do a lot of things as one person, but imagine what we can do if we all band together and help push girls farther and farther every day? Check out more from Codi here!